Looking for more movies like All Eyez on Me that give you an inside peek into the lives of some of the biggest names in rap music? You don’t have to be a fan of rap to appreciate these five other movies (although it does help). If you haven’t heard, All Eyez On Me is an upcoming biopic movie that features action and drama. 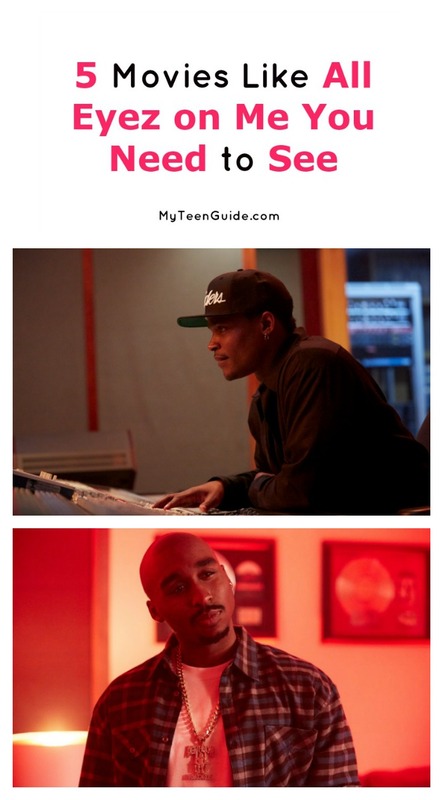 It is set to hit theaters on June 16, 2017 and is based on the life of rapper/record producer, Tupac Shakur. Here are some other movies to watch if you’re craving a deeper look into the rap scene. 8 Mile is a 2002 drama movie. Set in 1995, young, upcoming, struggling rapper, Jimmy Smith Jr., dreams of making it big, but those in his life make things rather difficult for him, including his alcoholic mother, Stephanie. 8 Mile stars Eminem as Jimmy and Kim Basinger as Stephanie. While it’s not an exact biographical look at Emimen, it was based on his life experiences. Biggie & Tupac is a 2002 biographical crime documentary. It focuses on the tragic and untimely deaths of Christopher Wallace, AKA Notorious B.I.G on March 9, 1997 and Tupac Shakur on September 13, 1996. Biggie & Tupac features archive footage of the two rappers. Get Rich or Die Tryin ’ is a 2005 biopic hip-hop crime movie. It is loosely based on the life of rapper, Curtis Jackson, AKA 50 Cent. Marcus Greer is a drug dealer, who trades his life of crime for a career as a rapper. Get Rich or Die Tryin’ stars 50 Cent as Marcus. Notorious is a 2009 biographical drama movie. The movie focuses on the life of Christopher Wallace, AKA Notorious B.I.G, including his tragic death on March 9, 1997. Notorious stars Jamal Woolard as Notorious B.I.G., Anthony Mackie as Tupac Shakur, Derek Luke as Sean Combs/Puff Daddy and Angela Bassett as Voletta Wallace. Straight Outta Compton is a 2015 biographical movie. Hip-hop group, N.W.A., from Compton, California, changes the world of hip hop music in the mid-1980’s. The group consisted of Eric Wright, AKA Eazy-E, O’Shea Jackson, AKA Ice Cube and Andre Young, AKA Dr. Dre. Straight Outta Compton stars Jason Mitchell as Eazy-E, O’Shea Jackson Jr. as Ice Cube and Corey Hawkins as Dr. Dre. Other movies have come out over the years either starring or detailing the life of a rapper, but these guys are pretty much THE scene. Basically, if you want to know more about that world, they’re the ones to watch. Do you have any other favorite movies like All Eyez on Me that we missed? Share below!